“Out of cage” time and time spent with your parrot are two different things. The time your bird spends on it’s kitchen perch watching you do the dishes cannot be a substitute for hands-on, interactive play, training and communication. While out of cage time is enjoyable for your bird, time spent engaging your bird is more important. It is stimulating, creative and an important part of your bonding process. 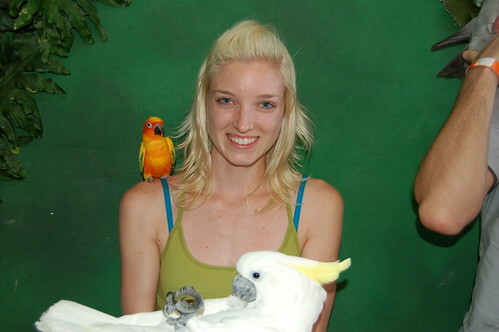 I have always been amazed at just how patient my parrots are with my “human-ness” and my hectic life. They put up with a lot, but even the most easy going of my birds will let me know when enough is enough. If we don’t pay attention to the body language and sure signs of discontent, it would seem like their mood turned on a dime, catching us completely off guard. This is likely the cause of the above “unexpected” bite. It is probable that the eclectus was waiting for interaction from it’s owner, and as it was perched on the shoulder, out of the line of sight, the signals were missed. A bite may have been the only way left to get the attention of his owner who was absorbed in a book. 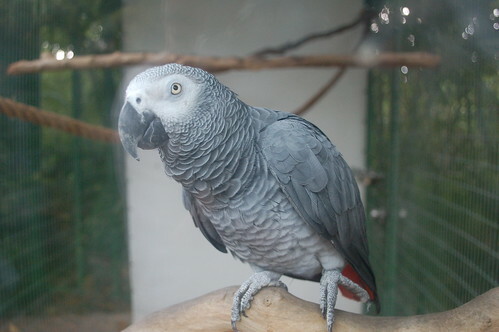 2) Your African grey is contentedly pulling a one-footer on his favorite perch in the back corner of his cage. You walk up to the cage and politely invite him out for a visit. You reach in to retrieve him and then wham! You count your fingers, expecting not to get past four. I think that the normal usage of the beak is more for chewing and less for biting. In a wild setting, birds typically squabble for perching rights, food and territory. Rarely, very rarely, do birds ever engage in bloodshed. Most birds will typically flee rather than fight. Given this fact, trainer Steve Martin makes an excellent point in that our caged birds have had the alternative to flee removed and sometimes the only recourse is to bite. Taking this into account, if your bird preferred to stay in his cage to sleep, what were his options in this example of the “unprovoked” bite? Being that he was cornered in a cage with a “demanding” hand in his space, as the bird may have perceived the event, he was left with little alternative. And, not to mention, most people clip their birds’ wings nowadays so the “flight” part of fight or flight is missing and all that’s left is fight. Since there was no emergency requiring that your bird readily step up, retrieve your hand and let him be. If your bird doesn’t immediately and eagerly respond, it is a sign that he would prefer to stay where he is. There is no good reason to force your will on a parrot, opt instead for a cooperative effort and a meeting of the minds. You will find that the more respect you show your parrot, the more agreeable he will be to seeing things your way at times when you need or want him to. 3) Your sun conure is very bonded to you and wants to be a part of everything you do. Your husband and the bird do not share the same good relationship. She is happily perched on your shoulder while you go about household tasks. Your husband approaches you, and your sun conure takes a bite out of YOUR chin. Why? Avian behaviorist and author Sally Blanchard states that when a bird feels threatened in the wild, it will bite its mate causing it to flee. Since a single bird cannot defend its mate and territory at the same time, this action frees it of the immediate responsibility to the mate and allows it to concentrate on the defense of territory. Steve Martin, however, contests this by saying that biting one’s mate is a poor species survival strategy, and doesn’t do much good in terms of bonding among mates. 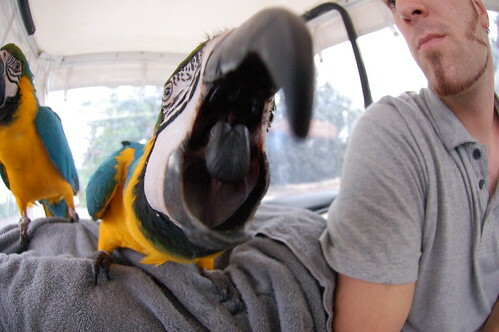 Mattie Sue Athen, author of Guide To A Well Behaved Parrot, puts it down to “displaced aggression”, citing that birds are of the mind that “when you can’t be with the one you want to bite, bite the one you’re with”. I find some truth in all of these perspectives. The one common denominator is probably hormones. In this case, the sun conure has chosen the wife as her mate and is defending its territory by deflecting the attentions of the disliked husband. The first part of the problem lies in allowing a bird to respond well only to you. It is your duty to see that your parrot be socialized, not only to everyone one in the household, but to all humans. If something were to happen to you, the parrot would likely spend the remainder of it’s lifetime being bounced from home to home to shelter because of its inability to get along with anyone that isn’t you. It’s unfair and completely unnecessary. Make sure your bird is handle-able by everyone from its first day in your home. Birds very often will choose a favorite person that he prefers to be with. That’s just fine, as long as it also plays nicely with the rest of the family. Let those “out of favor” be the ones who do the fun things like offer treats and fun interaction and training. 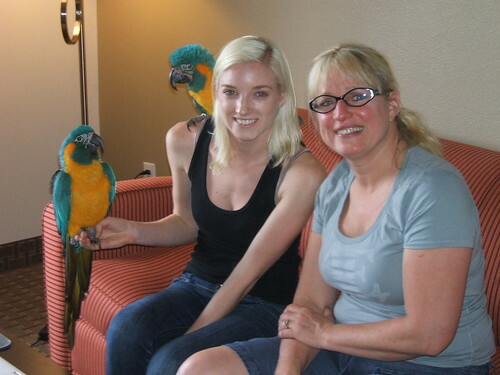 Gradually bring your parrot around to being a family bird. Any of this sounding familiar? More often than not, it is the circumstances accompanying the bite that are more questionable than the bite itself. 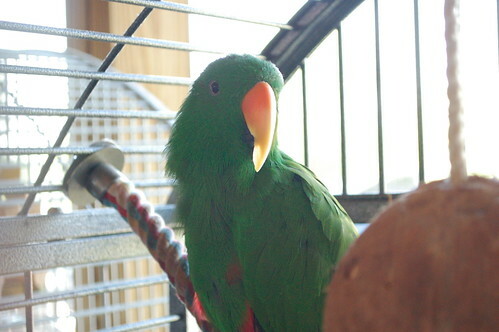 In almost every case where a human is bitten by a parrot, the fault lies with the human and not with the “unreasonable” parrot. The trick is in learning to read your bird’s body language and signs, understanding a bird’s natural responses, avoiding situations that might be problematic and forming a bridge of communication with your parrot that you can both understand through training.